Jute is probably the most popular vegetable fiber after cotton. Although it is used for myriad applications, it has always been associated with the packing industry. 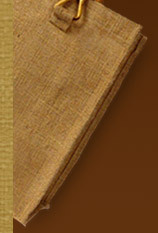 The coarse brown fabric used for packing Ã¢â‚¬â€œ is that not the first thing that comes to your mind when you hear the word Jute? But guess what, this coarse brown fiber has come a long way and if you look around, you will note a plethora of it's manifestation - Jute Bags, Jute Office Bags, Shopping Bags, Purses, Wall Hangings, Apparels, and the list goes on. Although there are umpteen number of reasons, the one single point that boosted the popularity of jute office bags in this environmentally conscious age is the eco friendly property of the fiber. Its popularity especially rose in the corporate world, chiefly owing to the awareness of the green movement and efforts to save the planet. Toady, eco friendly jute office bags are in vogue and a lot of office goers can be spotted using them, instead of the leather/synthetic ones they used before. Apart from being eco friendly, these eco friendly office bags prove to be more functional, as they are comparatively cheap, can withstand more rough usage and needs almost no maintenance. Office Jute Bags are also the perfect option from the promotional point of view, as many customers and potential clients appreciate the use of such useful but eco-friendly products as part of a promotional campaign. Where to get Jute Office Bags? Along with the popularity, the jute industry witnessed a rapid rise too, and today we have numerous organization and retail shops, both in the international and domestic market, that deal exclusively in jute bags and products. A profusion of individual designer outlets have also cropped up, exhibiting the trendiest of designs, shapes and colors. On the other hand, as plastic bags are starting to be phased out, with various countries already already forbidding their usage, jute bags have become the easy substitute and hence are readily available everywhere. 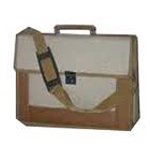 Why Jute Office Bags for Office? It is durable, lasts really long and can be subjected to rough use. It is inexpensive and cost effective and complies with your budget. It is easily available anywhere. It gives you an image of eco-conscious and aware human being. Any kind of design, logo and imprint can be done as required.